Ulrich Johannes Schneider, director of Leipzig University Library, which holds part of the manuscript, said the publication of the Codex online would allow anyone to study a work of “fundamental” importance to Christians. “A manuscript is going onto the net which is like nothing else online to date,” Mr Schneider said. There are other older manuscripts, but this is perhaps one of the two oldest complete works. The New Testament Canon – From the Bible Itself This article, shows from the Bible and supporting sources, why the early Church knew which books were part of the Bible and which ones were not. This entry was posted on Tuesday, July 22nd, 2008 at 12:36 pm	and is filed under Church History. 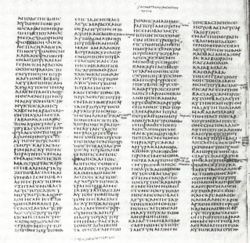 1st Century Gospel of Mark Text Found?